If you are running a service or consulting business, it's important to make a good impression. You also want to make it as simple as possible for your client to pay you. 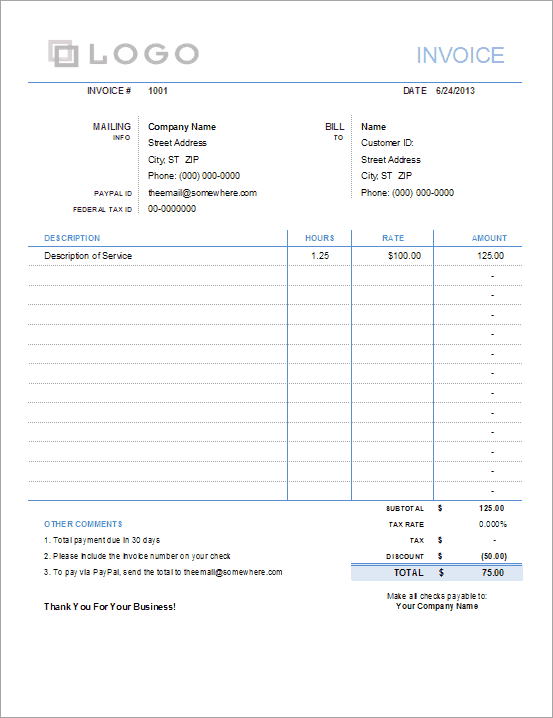 I created this new invoice template with those factors in mind. In addition to the simple design, you'll see that there is a place to include your PayPal ID so that you can offer your clients the option of paying via PayPal. If you are in the U.S. and charge over $600 over the course of the year, you'll probably need to give your client your business's Federal Tax ID number (so they can send you a 1099-MISC). You can include this extra info right under your mailing address. You can use these ideas to easily customize our original service invoice templates as well. This new invoice template was based on the light version of our simple invoice, but it lets you calculate the totals by entering hours worked and your hourly rate. As I mentioned above, it also includes a place to list your PayPal ID and Federal Tax ID. If you don't want to include that information, you can just delete those cells in the spreadsheet. Don't forget to update the "Other Comments" section as well. You can still use this invoice to list items that are not based on hours and rate. For those types of charges, just leave the HOURS and RATE columns blank and enter the charge manually in the AMOUNT column (overwriting the formula). You'll see that there is a place to list a discount. If you aren't going to provide a discount, it would probably be best to change the label from "Discount" to "Other" and set the value to zero. You don't want your client wondering why you didn't give them a discount.